Why are Archings so Important? 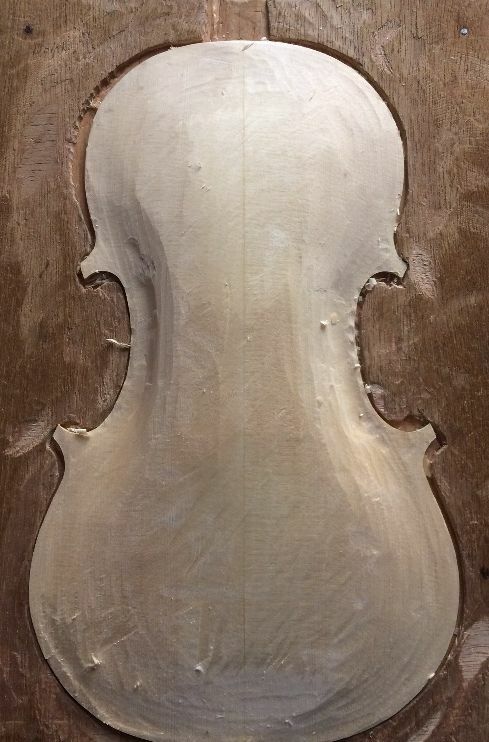 I wish I could give a scientific, rock-solid answer, based on the physics of sound, plate vibrations, etc., but I can’t: All I can say for certain is that the arching of the plates is possibly the single most important factor in producing good sound in a violin…with choice of wood being the closest other contender…maybe. I was told that, during his career, Bob Bein of “Bein & Fushi” violins, could tke a single glance over the individual archings of a pile of violins, and immediately sort them into the “keep” pile and the “discard” pile…and he was consistently correct. The ones he kept became great-playing instruments and the others…well, who knows? They went elsewhere, and someone else struggled with them. But all he was seeing were the archings. These instruments were not even set up– and he was not thumping and listening (as I still do)…his eye told him what the possibilities were. I wish I could explain that, but I can’t. 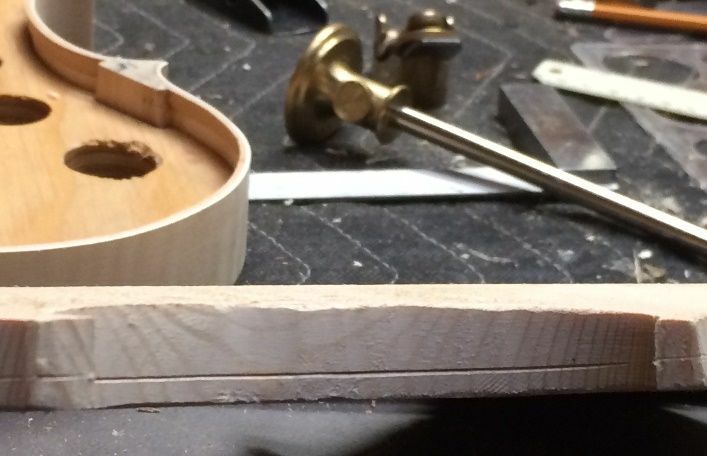 In the last few years, mainly due to the research of other makers, I have become convinced that a particular curvature, predictable by mathematics, and, importantly, by mathematics that were completely available to the Cremonese makers, may be largely responsible for that sought-after sound. These curves are called either “hypo-cycloid” curves, or “curtate cycloid” curves. Is it possible, still, that some “holy grail” of tonewood was the key? Sure…but other makers of the same period, using what seems to be the same wood, were not able to capture that tone. 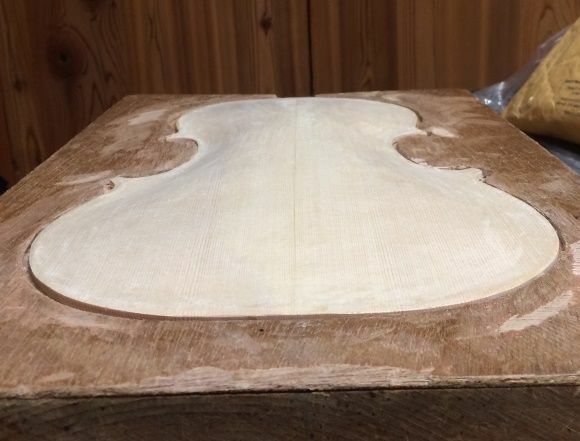 Furthermore, some modern makers have managed to acquire wood from that time period and area, and have made violins of it. Nothing remarkable resulted. Could it still be the subsequent treatment of the wood…some arcane chemical treatment, that gives that special sound? I suppose it could be, but every time someone does chemical analyses of the tiny, precious chips of wood from those instruments, after repairs, all they seem to come up with is that it may have a mineral ground of some sort (jury is still out on that one), and that, otherwise, it simply has a varnish comprised of linseed oil and larch resin, or pine resin, or something similar. Nothing special there, either. Annnd, all the modern-day experiments done with rabbit urine, horse manure, potassium silicate, and a variety of unlikely-sounding candidates for “the secret” have all turned out pretty unimpressive, to the best of my knowledge. So…no secrets to reveal, today. Sorry. So…No more “by guess and by golly!” I have done it with compass and straightedge and calculator, for my own models, but this time I lifted the arching template designs from the poster. Incidentally, when I take my arching templates directly off the posters, I get the same curves, so…I made the arching templates, both front and back, longitudinal and transverse, and I do try to use them. Using a wheel marking gauge to scribe the edge thicknesses. 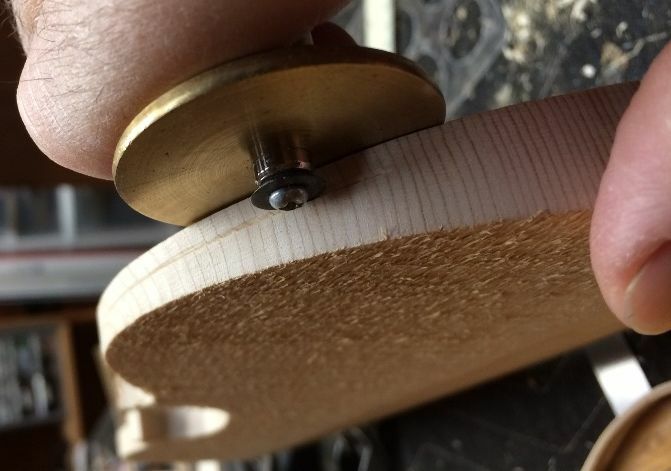 I moved my hand a little while taking the photo…the brass wheel is held tightly against the flat of the plate. The result is a line parallel to the flat side of the plate, exactly delineating the right thickness for the edge. Preliminary arching (very rough) of front plate. It is still far too high and “puffy”. I use arching templates, either derived mathematically, or traced from a poster, to adjust the shape of the plates. This is the longitudinal arching template, specifically for the front plate. Once this curve is right, I can adjust the transverse archings. Beginning the transverse archings. The fit has to be nearly perfect, to maximize the benefit of the arching plan. Things are beginning to smooth out. There are definitely a host of humps and hollows to remove, but I am pleased with the beginnings. The view from the bottom of the plate. It’s hard to see the curves, but they are looking pretty good. 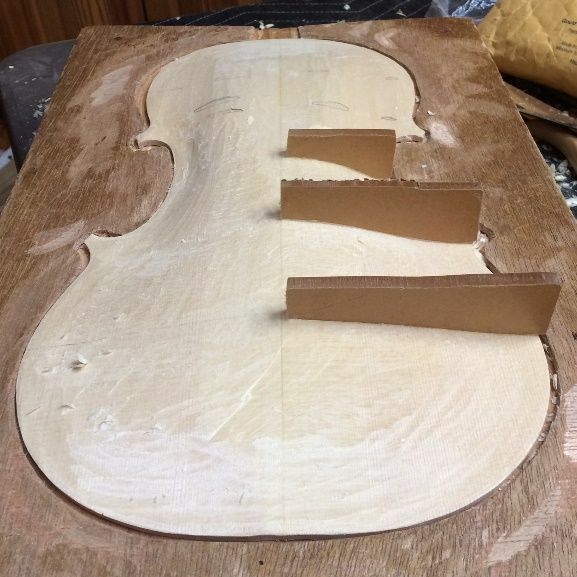 The back plate arching, though different from the front, is accomplished in exactly the same manner. I will show pictures of it another day. I’m getting pretty tired. 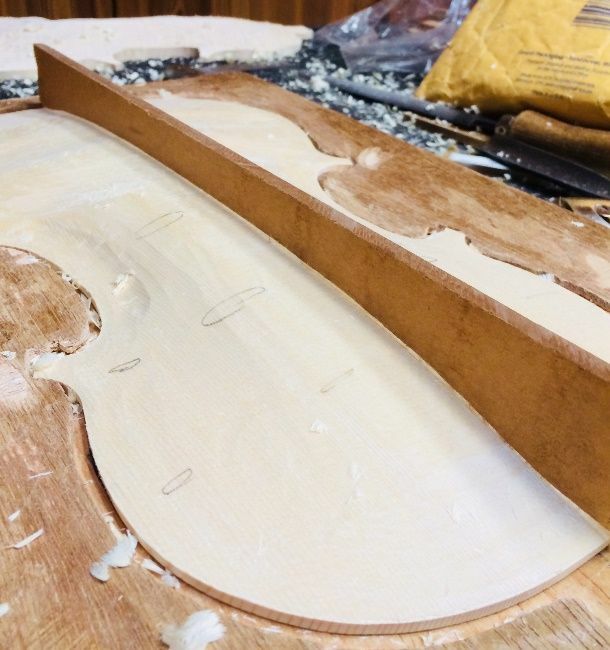 Once the outer archings are as close as I can get them, I will flip the plates over in the cradle, and carve the inside arching, carefully monitoring the thicknesses all over the plate. This pattern of thicknesses is called “Plate Graduation”, and they seem to be fairly important, too, though not nearly so much as the archings. 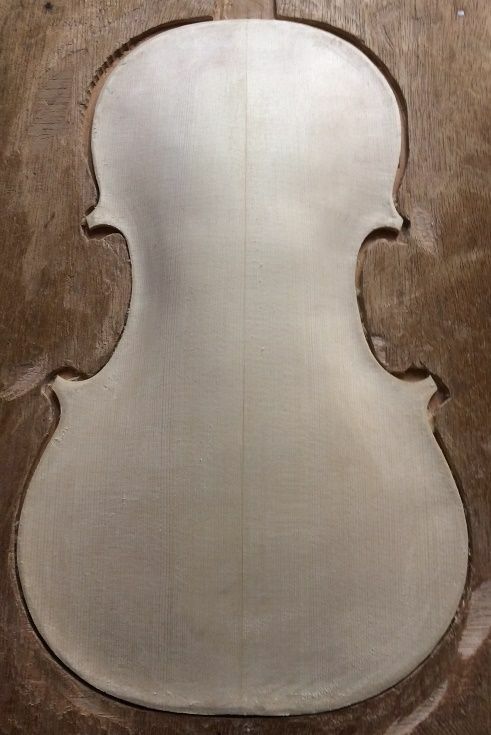 I have completed the back arching, too, and I will show it in the next post. Are there significant differences between how these arches worked out and the arching on the poster? I have (somewhat) avoided the sore hands this time, by using the extended handles on my Ibex planes. I carved them out of maple, and they are imprisoned between the (inverted) screw on the cap and the blade itself. I will try to make sure some photos are in my next post. I only have two of them, for my largest and middle-sized Ibex planes, and, usually, I leave them on the plane-bodies with the toothed blades. But it would be so easy to switch them out, or even to make some more of them. I just never think to do it.